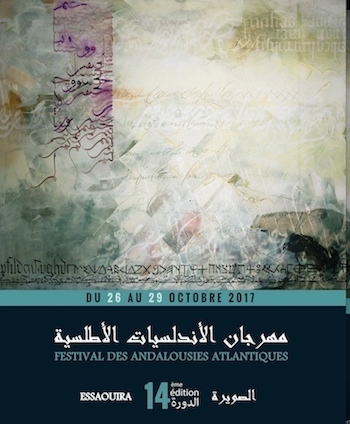 Held yearly in October for the past 14 years, this year’s Andalusia-Atlantic festival is the 14th edition and takes place from Thursday October 26th – 29th, 2017 on the Coast of Morocco. The Atlantic Andalusia Festival highlights the Andalusian musical heritage of the Spanish-Moroccan cradle. It is the perfect fall event for all music officiados and those with a penchant for the coastal town of Essaouira. The Andalousia-Atlantic festival is one of three of Essaouira’s most important cultural events. The Andalousia-Atlantic festival together with the Gnaoua Festival & World Music festival along with the Printemps Musicale festival make Essaouira one of Morocco’s liveliest places to visit. 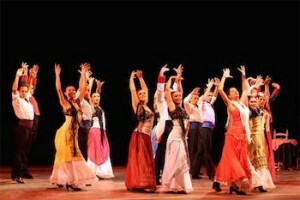 The Andalusia-Atlantic festival pays homage to the shared Arabo-Andalusian heritage of Morocco and Spain. As a coastal town on the Atlantic that has tourists visiting year round, Essaouira historically has been known for it’s openness, the arts and for it’s fresh seafood. Often referred to as an artist colony with a strong alize, Essaouira boasts a wide variety of music festivals and artists both Moroccan and foreign who live there year round. The Andalusia-Atlantic festival concerts are free free with limited seating. Seminars, discussions and workshops on various cultural subjects are held and offer a stimulating and engaging atmosphere for those interested in topics related to music and culture. 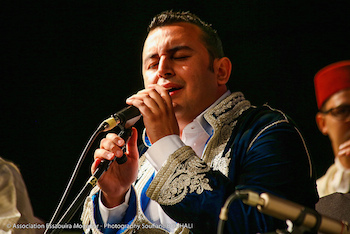 Highlights of the 14th Andalusia-Atlantic festival is the 14th festival are, an opening concert featuring Abderrahim Souiri, and Rabbi Haim Louk, one of the leading icons of Judeo-Andalusian music. These two outstanding musicians will be accompanied by Mohamed Larbi Temsamani’s tetanus orchestra led by the great master Mohamed Amine El Akrami. This series of 4-day concerts the concerts will also feature pieces of popular Moroccan repertoire, such as chaâbi, chgouri and melhoun revisited by Raymonde El Bidaouia, flamenco. Distinguished guest, Mercedes Ruiz, elected in 2015 flamenco star dancer in Spain will perform accompanied by her musicians and singers. 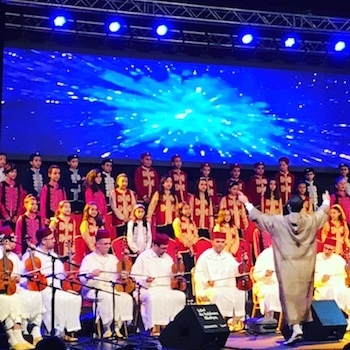 Another highlight of this edition is the unpublished duo of Rabbi David Menahem, a homecoming for him, and Palestinian singer Loubna Salama, who is coming to Morocco for the first time. Musicians from other regions of Eastern Europe will also be featured such as the Czech group Letajici Rabin, Yiddish, Klezmer and Gypsy music. 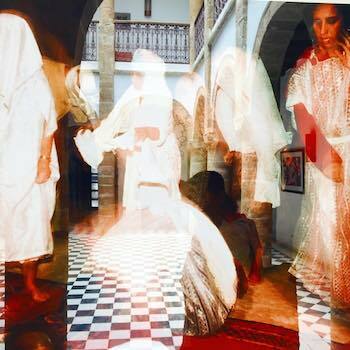 In the spring and summer of 1995 the writer and filmmaker Pierre Guicheney, the ethnologist Viviana Paquew and photographer Jean-Luc Manaud produced for the French edition of Geo Magazine a report on Gnawa and Aissawa rituals and pilgrimages in Marrakech, Meknes, Moulay Brahim, and Tamesloht. Jean-Luc Manaud brought back exceptional images from the immersion. The French Institute in Essaouira is featuring a comprehensive exhbition and homage to Manaud from May 12 to through July 23, 2016 called “7 Colors of Jean-Luc Manaud.” The exhbition is comprised of two levels of photographs that are mounted on the historic walls of an 18th Century building that the French Institute in Essaouira occupies on Rue Laaloug. There is also a complimentary documentary by Pierre Guicheney Le bal des génies (1998) that is being screened during this exhibition. Jean-Luc Manaud was born in the southern city of Gafsa in Tunisia. Manaud was a regular contributor to Le Figaro Magazine and Géo, touring the world of guerillas from Eritrea to Cambodia. In the early years of 2000, Manaud began painting on Polaroids, writing travel and children’s books combining calligraphy, drawing, cut-outs and photographs. Manaud passed away in 2015. The exhibition at the French Institute in Essaouira is a tribute to his works of Art, made in Morocco. 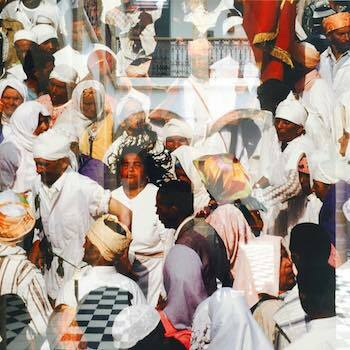 For more information about Essaouira Art Tours. 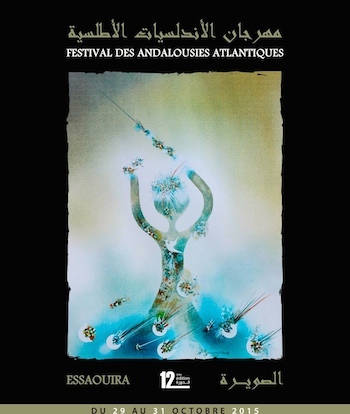 Each year Essaouira hosts the Andalusian Atlantic Music Festival (The Festival des Andalousies Atlantique) which pays homage to great musicians and the Andalusian legacy of hispano-Moroccan traditions in the Magreb. Celebrating the friendship and shared history between Spain and Morocco the 12th Annual Andalusian Festival of Essaouira will take place from October 29th – 31st, 2015. Founded in 1992 by Mr. Andre Azoulay, a Senior adviser to King Mohammed VI of Morocco, the Andalusian Atlantic Music Festival celebrates the diverse heritage of Moroccans and the town of Essaouira’s historical co existence of Jews, Berbers, Spaniards, Muslims and Christians who contributed in weaving together a multicultural and rich artistic coastal town. The 12th Andalusian Atlantic Music Festival features concerts along with round table discussions and debates led by academics and professionals in the artistic field as to contribute the importance of cultural diversity. 10h Projection of the film “Aida” of Driss Mrini on the relationship Judeo-Muslim connections in Morocco.